I miss lots of great moments while I'm at work. For example, this morning, I missed Martin rolling over for the first time. No, wait, I wasn't at work when that happened, I was sleeping. Is it wrong that I wouldn't trade in that sleep to have caught that moment? Maybe I'm a bad father. Apparently most babies don't flip over for the first time until they're four months old. I guess that means that any day now they'll start sleeping for six or seven hour stretches at night. I'm confident that's exactly what that means. Yesterday I missed a monkey hoodie fashion show and Hall & Oates listening party. Even the best day at work cannot compete with that sort of day. 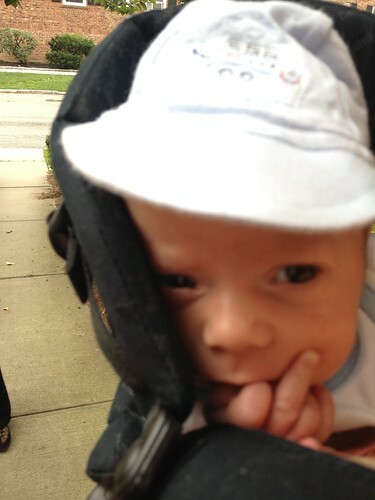 I also missed Elliott going on a Baby Bjorn adventure. I thought, from this photo, that he did not enjoy his adventure but his mother got very upset when I made this assumption. Maybe it's getting his photo taken he does not enjoy. Something must have inspired this gesture. It also sounds like I missed another full day of the care and feeding of babies which, of course, meant that the adults don't get out of their bathrobe until 2:00 PM or get anything to eat other than a granola bar. At least at work I get a lunch break. 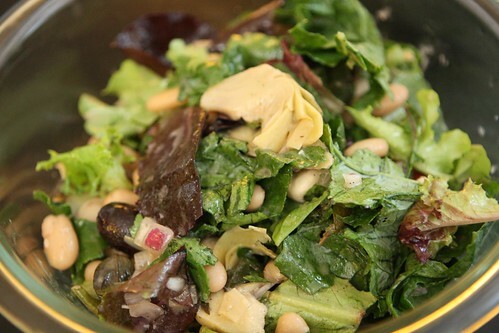 I made up this salad with some of the farm kale, baby greens, and the remainder of my aunt Pat's bean salad. I call it "beans and greens." Jen was tentative in her consumption of this due to our flimsy theory that the beans may have been resulting in the babies' recent gas attacks. I would eat nothing but Saltines if I were here but, then again, I am overly cautious about such things. If there are two things Jen hates it's repetitive eating and Saltines. For the main course I picked up some beautiful swordfish which I blackened along with some shrimp. 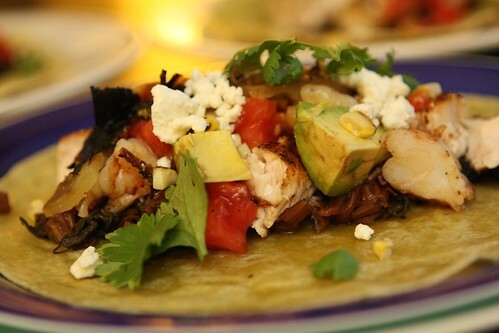 I served them in a pan-toasted flour tortilla with grilled corn, tomato, avocado, feta cheese, grilled farm peppers, and cilantro over a bed of the remaining Bright Lights Swiss Chard. 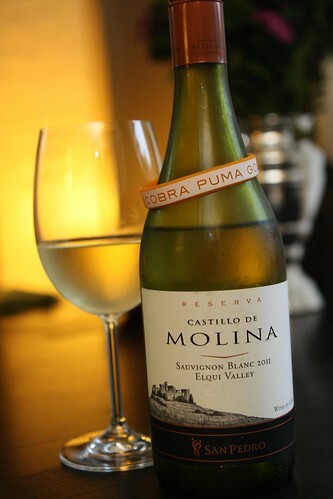 As the official Baby Duty Bartender, I served up a glass of this 2011 Sauvignon Blanc from Castillo de Molina. I think Jen got this at some sort of work event. Between all the guests we've had lately along with Jen being able to drink again it sure is nice being able to clear out some of our wine collection. It is amazing how much wine one can accumulate in the course of nine months without even trying. People just seem to give you wine all the time! I just need to figure out how I can get people to bring me beer all the time. Until then I need to continue buying it myself. Tonight, I celebrated the first time I didn't have to use a Champagne stopper to reseal a large bottle of beer and drink it over two nights. 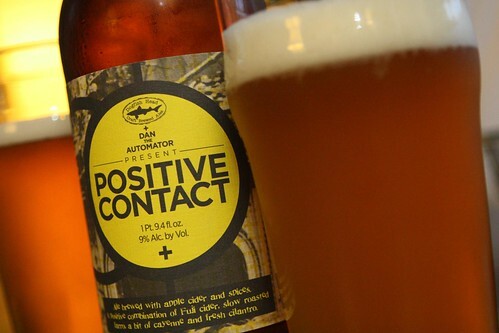 Jen was able to help me finish this bottle of Positive Contact by Dogfish Head in one sitting! This is an odd beer. That much could be discerned simply from the Dogfish Head logo on the bottle. It's made with farro, apple cider, cayenne, and fresh cilantro. It has a very distinct sweet and sour apple taste to it. I didn't detect much of the cayenne but the cilantro could have been mistaken for a normal soapy scent associated with beers of this style. It had the distinct flavor of Belgian yeast which I enjoyed quite a bit. This beer was strange but in a completely different way than I'd expected. This beer was another from Dogfish Head's musical collaboration series. The first I had was their Miles Davis collaboration, a musician whose music I enjoy quite a bit. The second I had was their Pearl Jam collaboration, a band whose music I don't enjoy at all. This one is a Dan the Automator (of Deltron 3030) collaboration, a musical act that I know nothing about other than I think I heard someone mention Dan the Automator at a party once in 1998. And, again, it's off to work. Tomorrow we have the tentative plan of going out for dinner -- something we haven't done since the babies came home. With Jen's mother leaving this weekend this could be our last opportunity for such an adventure for the next eighteen years. I'll leave you with a little Deltron 3030's Positive Contact to bounce your head to while you consider how tomorrow's plans will be thwarted.